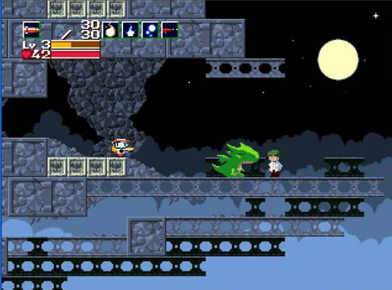 Cave Story (Doukutsu Monotagari) is currently a freeware game for the PC that was originally released on December 20, 2004. Developed by Studio Pixel (Studio Pixel is actually just one guy, I guess, Daisuke Amaya), it’s a 2D non-linear platformer somewhat similar to Metroid or the newer Castlevania games. I had not heard about it until now, and since it’s currently free, I decided to try it out since I love the classic Metroid games. I was honestly amazed, I haven’t played a game that has the same atmosphere as Cave Story since…I don’t know, maybe Shadow of the Colossus. I can’t explain what aspect of the game play made me feel that way, but with everything combined it truly feels like a masterpiece. Doukutsu Monotagari spent five years creating the game, and it shows in all areas. The first thing that stuck out to me was the music, which is amazing. It reminds me of no game in particular but at the same time still evokes Super Nintendo era feelings. The soundtrack alone just brought back these great memories of games gone by, it was really impressive. I’d almost compare it to Chrono Trigger, maybe…not that the music sounds the same or even similiar, but the level of musical quality. Songs that stick in your head long after you’ve finished playing the game. In 2049, the human population of Earth embarks on a migratory voyage to try and colonize other planets. They leave mechanical “orbots” to clean up the mess they made on Earth through littering and pollution. Raster, a high-level orbot who watches Earth through a planetwide computer network, is accidentally attached to a working nuclear missile by a lesser orbot and goes insane, becoming an evil dictator named Warhead. He declares himself ruler of Earth, and begins preparing to execute any humans who dare return to their planet. Enter Vectorman, a humble orbot in charge of cleaning up toxic sludge by simply discharging it into the sun. As he lands on Earth after his last trip, he finds chaos and confusion. Because all the other Orbots are controlled by Warhead (Vectorman having not been affected because he was away), Vectorman takes it upon himself to destroy the errant orbot and restore peace to Earth. The robots will clean up our mess while we’re living it up on Mars. Also, Super Dodge Ball was always a fun game to play…I don’t particularly remember why, I just remember always enjoying it. Galaxy Man: level consists of portals that fling Mega Man all around the level, maintaining his momentum with each fling (a lot like Portal, actually), plus enemies that divide into multiple copies of themselves. Splash woman! I guess we have girl bosses now. What is the world coming to.